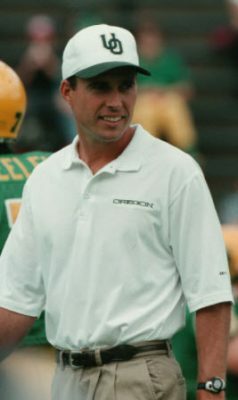 Following the 2000 “Desert Miracle” victory over Arizona State, the high-flying Oregon Ducks were now soaring solo atop the Pac-10 standings. A week later on November 4, 2000; Oregon traveled to Pullman, Washington for a date with Washington State. Coming off a natural high following a miraculous win over the Arizona State Sun Devils, Oregon remained the only unbeaten team at 5-0 in the Pac-10. Many Duck fans fondly remember the “Desert Miracle,” but it often overshadows a similar nail-biter the following week against Washington State that had its own fair share of heroics, anxiety, and luck. Oregon went from playing in the hot Arizona sun one week, to a bitter cold and wet day in the Palouse. It had snowed all morning, turning to rain in the afternoon. The field had to be snow-plowed before the game on that cold, rainy afternoon at Martin Stadium, leaving the turf conditions murky at best. The field remained wet and slick all game to slow, preventing a repeat of the 50+ point performances by either team witnessed the week prior, but the game would prove to still have more than its fair share of tension and absurdity by the time it was all done. Several plays later, Oregon would gamble on fourth and one from the eight yard line. 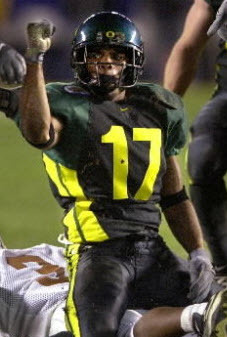 Maurice Morris was pitched the ball heading left, passing the first down marker and waltzing untouched into the endzone to immediately claim the lead. 7-0, Oregon. In only five plays, Oregon had travel 65 yards in under two minutes. Many thought Oregon would take their opening momentum and the high from the previous week’s unbelievable win and quickly pound the Cougars into submission from there. 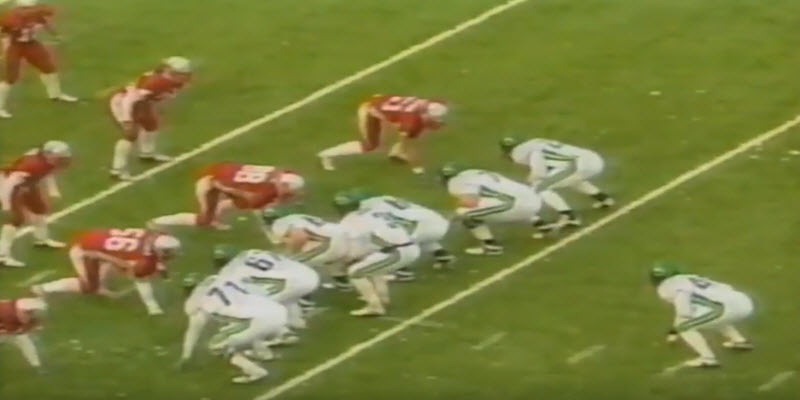 However, what looked to be an easy game against a mediocre Washington State team proved to be anything but after that opening drive, but keeping with tradition of the Cougars always playing Oregon tough at Martin Stadium. The Cougars came right back on their first offensive series of the game, as Jason Gesser began his emergence towards all Pac-10 status. In the first three plays, Gesser marched Washington State downfield; running for a first down, followed by a razzle-dazzle double pass from the wide receiver to lead WSU inside the five yard line. A run punched it in within two minutes as well, tying the score at 7-7. Each team had one possession and one score in the first five minutes to open a great game. It appeared it would be another offensive battle much like the previous week for Oregon, but what had started fast quickly became quite a defensive battle, as each team would struggle offensively and big defensive stands were made one after another. Harrington and company appeared to be on a scoring drive, but a bad throw by Harrington was intercepted near the end zone to give WSU the ball back. On Oregon’s next possession, the offense struggled to find rhythm again, failing to convert two third down conversions with huge hits in the backfield on Morris and Harrington. Following a punt into the wind, WSU got great field possession at midfield and went to work from there. Gesser led WSU into Oregon territory on the first play of the series on a 20-yard strike, but were unable to finish off the drive. The Cougars were held, but took the lead from the usual first quarter-dominant Ducks with a long 41-yard Field Goal (to begin a series of special teams dominance.) 10-7 Washington State. It appeared WSU was in control as the speed of their defense stopped Oregon on their next possession and forced a punt. They would get the ball back at their own 30-yard line with the lead and momentum. However, the good times did not last long for the Cougars. At the very end of the first quarter, Washington State had the ball again deep in Oregon territory. Jason Gesser threw it in the direction of an open receiver to the left, but underestimated the powerful superstar cornerback Rashad Bauman, who was short in stature but big in heart and play-making ability. Bauman came through as always for the Ducks, stepping right in front of the WSU receiver and racing for the end zone with his break away speed. No one stood a chance at even touching Bauman as he raced for the end zone and scored his third career interception touchdown as a Duck! The PAT would be blocked, and would later prove to be crucial to the score. 13-10 Oregon, to end the first quarter. Early in the second quarter, the rain and snow mix really came down to create a slushy mud bog field. Bauman came through big for Oregon again on a great tackle to prevent a big gain, followed by a few dropped passes in the blinding storm to give the ball back to Oregon. 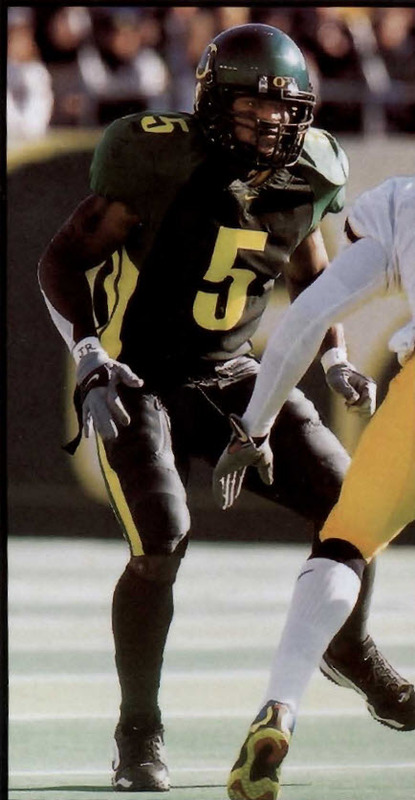 On the punt return, Keenan Howry came through for Oregon on one of his many terrific returns, eluding several tacklers across the field at his own 30, using his speed down the sidelines to make something out of nothing and give Oregon great field position at the WSU 38. Oregon was unable to continue the momentum given by Howry, failing to convert a first down from there. Oregon was too close to punt, but it was a little too risky to go for it on fourth down at the 30 with two yards to go, so Head Coach Mike Bellotti opted to try a long field goal. Senior Kicker Josh Frankel was called upon, and Frankel well atoned for his mid-season struggles, beautifully connecting on a career-long 46 yard field goal to put the Ducks up by six points. 16-10, Oregon. The struggling and cold football teams were unsuccessful in finding any offensive consistency from there, as the game went back and forth throughout the rest of the first half. Both teams traded one punt after another, often going three-and-out. Late in the second quarter, Jason Gesser was knocked out for the season with a broken leg. Matt Kegel came in for the Cougars to carry the team forward through the remainder of 2000. Right before halftime, Washington State found a spark. Kegel converted a third down on his very first play of the game to continue a Gesser drive into Oregon territory. Kegel and company completed three third-down conversions in the drive into the red zone, and punched the ball in from two yards out for a touchdown in Kegel’s first true drive as a Cougar. The PAT put Washington State up by one point. 17-16 Cougars, heading into halftime. Oregon’s achilles heal i the game had been their inability to convert on third down, not converting on a single opportunity the entire half, while WSU had successfully converted five, yet the Ducks only trailed by one. Saul Patu and company opened the third quarter big on defense with a huge sack by Patu, followed by a great break-up by Matt Smith to prevent a big third quarter opening spark. Oregon appeared to have a spark on its first drive into the red zone, but were penalized out of the red zone and forced to settle for a field goal. Frankel was forced to kick against the wind from 40 yards out, and had the angle but his attempt was blown short by the strong wind. From there, both teams struggled on offense as the third quarter came and went, remaining 17-16 through the end of the quarter. Early in the fourth quarter, Kegel and company would get into a rhythm, putting together a drive into Oregon territory. Kegel was impressive in his first moment in the spotlight replacing Gesser, leading WSU to a first down at midfield on fourth and inches, followed by a long pass completed to a diving receiver at the Oregon 8 yard-line. After inching closer to the goal line, the Cougars faced a fourth and one at the goal line, as Kegel took a dive over for the score to add to their lead. The seventh ranked Ducks were in jeopardy, being down eight points, 24-16, and possibly on the verge of a huge upset. They would need a touchdown and a two-point conversion to even tie. For the second consecutive week, the Ducks would have to rally big from a deficit for another fourth quarter comeback. As impressive and important as the drive, Oregon still trailed by two, due to the blocked PAT earlier in the game. A two-point conversion was essential to tie the score for Oregon. Harrington remained calm as usual, ready to prove his “Captain Comeback” title true for the second consecutive week. Harrington took the snap and rolled to his right. Keenan Howry waited on the right by himself while the lines were stacked up with a double TE set. Doing a short motion and waiting for the tight end to clear, Joey did a half roll-out. Howry faked out the defenders running in motion as the snap was made, then straight ahead for the end zone before colliding with the linemen, and across the end zone to the left to find open space and signal Harrington to throw it. Howry caught the strike from Harrington with no one nearby, and the game was tied 24-24 midway through the fourth quarter. 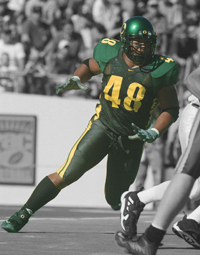 The Ducks would do just that, holding Washington State in check from there, following a huge sack by freshman Keith Lewis, beginning a career of huge hits and memorable plays in the seasons to come. Both teams failed to score in the remainder of regulation, so on came overtime for the second straight week for the Ducks. In overtime, the Ducks were forced to take the ball on offense first. WSU was tough on the Ducks, and the offense was only pushed backwards on the series. The Ducks faced a fourth and 15, and their only hope was a field goal. Frankel was called upon for his second field goal of the game. He’d already connected on a career-long 46 yard field goal, meaning he would have to beat his record by one yard to give the Ducks any points at all. A confident senior leader, Frankel came onto the field not letting any naysayer stand in his way! The snap was good, Harrington’s placement was good, and Frankel’s kick was up…. long enough… and…. GOOD! From 47 yards out, Frankel had broken from his mid-season slump, and forced Washington State to at least get a field goal to stay in the game. However, it was up to the defense now to come up with a stop, as a touchdown would win it for the Cougars. The Oregon defense remained calm, also pushing Washington State backwards. The Duks would force a three and out, leaving the Cougars to also settle for the field goal try from 39 yards out to force double overtime. In Field Goal formation, the snap and hold were made. Defensive Lineman Jed Boice had come a long way in his career for Oregon, and showed he deserved most improved player the most on that day. Boice broke through the line, stepped up, and knocked the ball down as it went up. Help us, Obi-Wan Chris-Kenobi … you’re the Huskies only hope! The ball sailed harmlessly to the cold ground, and the celebration was on!! Boice’s Field Goal blocked secured the victory for Oregon, their second straight overtime thriller, coming down to a special teams play. The confidence showed indeed. Despite all the obstacles teams like Arizona State and Washington State seemed to present Oregon on their home field, Oregon had the ability and confidence to work together as a team with a lot of heart to overcome much adversity. Oregon was now 6-0 in conference and in control of their own destiny for the Pac-10 title! For the second straight week, Oregon had narrowly escaped with an overtime victory over a tough conference road foe. FINAL SCORE: Oregon 27, Washington State 24.